Threatened by Kennedy's assassins and by his own government, secret agent Christopher follows the scent of his suspicion—one breath behind the truth, one step ahead of discovery and death. "As soon as he began publishing fiction more than three decades ago, Charles McCarry was recognized as a spy novelist of uncommon gifts" wrote Charles Trueheart in The Washington Post. 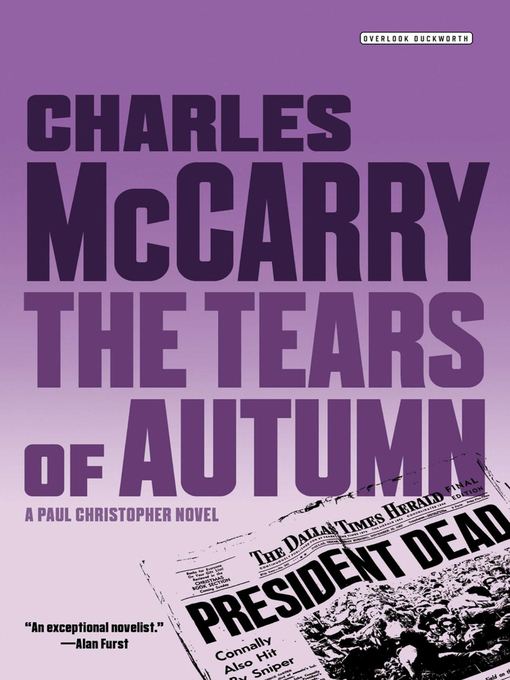 Tears of Autumn, McCarry's riveting novel of espionage and foreign affairs, was a major bestseller upon its first publication in 1975. Spun with unsettling plausibility from the events surrounding the assassination of John F. Kennedy, and featuring Paul Christopher, it's a tour de force of action and enigma. Christopher, at the height of his powers, believes he knows who arranged the assassination, and why. His theory is so destructive of the legend of the dead president, though, and so dangerous to the survival of foreign policy that he is ordered to desist from investigating. But he is a man who lives by, and for, the truth—and his internal compunctions force him to the heart of the matter. Christopher resigns from the Agency and embarks on a tour of investigation that takes him from Paris to Rome, Zurich, the Congo, and Saigon.